To achieve a longer useful life, AZFlow coolers are designed and manufactured using standards and practices developed and applied to industrial process equipment. These standards and practices for process equipment design and manufacture have been developed and enhanced over the past several years in order for this equipment to achieve an operating life consistent with design objectives and support investment recovery. Application of these standards and practices to AZFlow coolers results in a coolers that are able to consistently perform and achieve such a design service life. Of particular importance in achieving this objective are those selection criteria practices and standards used for cabinet and component materials selection consistent with the application environment. This graded material selection approach combined with the use of isolators to avoid galvanic corrosion between dissimilar metals is a driving factor in the longevity of AZFlow coolers. AZFlow coolers use 304-stainless steel for the wet section cabinet unless the unit is expected to see a salt air environment where 316-stainless is used to avoid chloride stress corrosion. The use of stainless steel in the wet section assures that all cooler surfaces that have the potential to be exposed to wetted will achieve a long service life. Consistent with the less corrosive environment found at the fan casing and associated structure, lower cost, heavy galvanized sheet metal is the material used for these components. 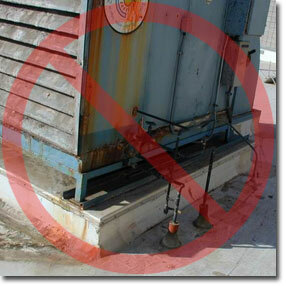 Insulating isolators are used to avoid galvanic corrosion where dissimilar metals interface. One example of such an interface is the stainless steel wet section to galvanized steel fan casing connection. In addition to the insulating insulators, non conductive PVC conduit is used to carry instrument and electrical cables. This avoids the conduit forming an electrical connection between materials as it carries cable from one area of the cooler to another. AZFlow coolers use blowers designed and manufactured to provide efficient and long term service. The motors for these blowers are industrial grade TEFC 3 phase 460 volt with duty cycle selected to match the application for long and efficient operation. Various styles of blower wheels are used to complete the blower assembly but all share efficiency and long life as a design attribute. These include: a) Direct drive tube-axial fans with aerodynamically shaped and die cast aluminum fan blades, b) backward inclined airfoil plenum wheels, and c) Single or double inlet backward inclined airfoil centrifugal blowers. All blowers are designed and selected to balance operating and initial capital cost with a weighting heavily on operating costs.